Daewoo Washer Has An Error Code? 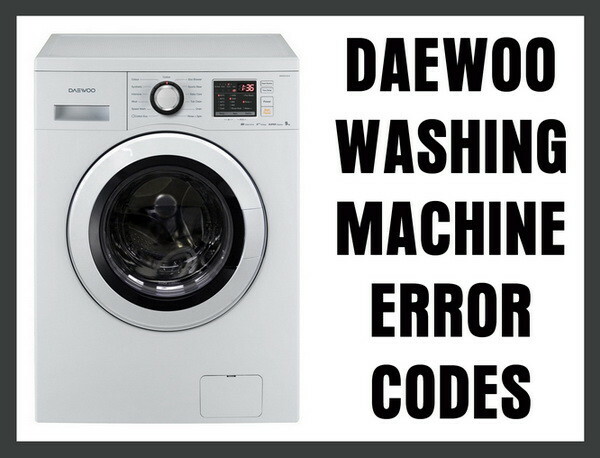 Here is information that will assist you in identifying what may be making your Daewoo washing machine display an error code. 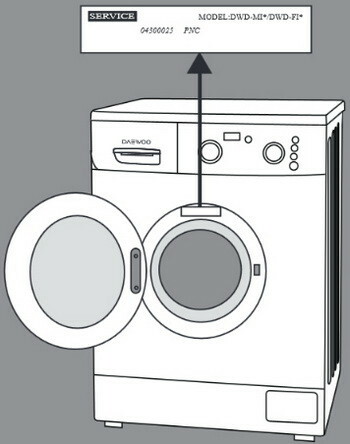 Identifying what the error or fault code is, will help you to repair your washer. 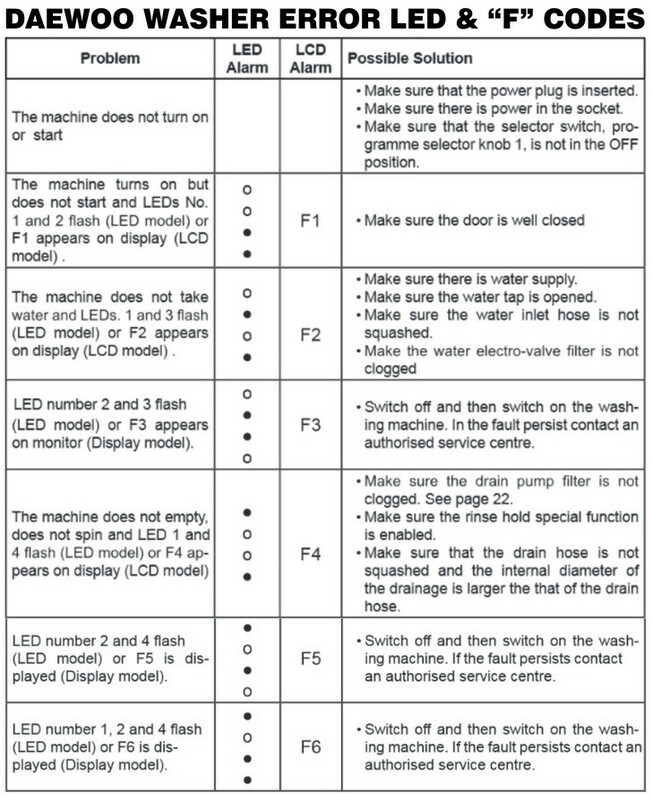 The Daewoo generalized error fault codes below are to give you an “idea” as to what part is at fault. These Daewoo error codes may not apply to all Daewoo washers. You may have to do further troubleshooting to find what may be causing the fault for that specific part. For more assistance finding the exact error on your washing machine, please ask a question below. Washer Has Detected: The laundry is jammed between the gasket and the drum… Rearrange. Check / Repair / Fix = The motor is faulty. Change the motor. The PCB control board assembly is faulty. Change the PCB electronic board. Google or YouTube to find the exact error code your Daewoo is displaying. Need assistance with finding an error code for your washer? Ask your question below and we will be happy to assist. Door is locked. (Opens after pulling plug.) Nothing else. Disconnected for 8 hours – same behaviour. My Daewoo DWD-FV5441 washing machine shows error code EO1. I have looked for this online and found nothing. Please help. My wash and dry daewoo shows error code h7 and dont dry the clothes wat is the errorcode? Mine is Daewoo washing machine DWF-8288, showing E1 and won’t spin and drain water, what is the problem? I have Daewoo washing machine dwd-hd1413 9 kg. I have error code b3. My DWD GM 1011 washer machine rinse is not working please let me know that what I do. I have a door light flash and beep on my Daewoo washing machine. I have changed the solenoid and checked the drain but still flashing! What is the model number of your Daewoo washing machine? My Daewoo DWD-F1013S washing machine keeps going on and off without anyone touching it, and when i put on to wash clothes, it keeps going on and off on its own. I have LE mess on my Daewoo machine… Can’t open door….. I dont know what to do? I have a Daewoo Washer DWC LD1412 that is displaying the error message “HI” and no longer functions whether the drum is empty or full. The code is not listed in the troubleshooting guide in the instruction manual. I bought the washing machine new 4 years ago and it is in very good condition / well maintained / and is used on average only 6 times per month. I have a Daewoo front load and the soap dispenser is filled to the top but there is still bubbles in the machine when it’s washing and the soap is also leaking on the floor. I have an 0E code on my Daewoo Washer and I cannot open door. Try unplugging the washer for 10 minutes to try and reset the board. Plug back in and the code will hopefully clear and you can open the door on your Daewoo Washing Machine. I have a Daewoo DWD-MH1011. I am having a problem with starting machine whenever I press the start button the machine sounds a two second beep beep. Machine is not starting at all, just beeping. I have Daewoo DWD-LD1411. Constantly showing error E8. How to fix the error code? I got an error code dE on my DAEWOO DWF 320L Washing Machine. The machine is not working… What could be the problem? This error shows if the door lock is not set to open or close when the door lock solenoid is operated more than 10 times. This error is cleared when the door is open or possibly the solenoid is tested to be in working order. Thank you for the info. I cleaned the solenoid and it’s working now. I have a problem with my mashing model Daewoo DWD-F1013 concerning the error OE. I read the Manual and I cleaned the drain filter but everytime I close it the same error comes up. How can I check the drain hose knowing that from outside everything is good and not broken and the high it 70cm/80cm. If I let the drain filter open the mashing spin normal. my daewoo inverter washer dryer is giving H3 error code, what does this mean? I get no errors but the machine shuts down and the water is still in there. I have to drain and then restart the cycle. Daewoo washing machine DWC-VD 1213S. It’s still new, just 5-6 moths use. It stopped spinning with OE, E3. I changed its place and it gives new errors E2 and E9. Sometimes it works fine after 2 days. The washing machine has detected an overfill situation and the failure code is displayed. The washing machine has detected an error with the pressure switch or level sensor. I have LE error message. I change door lock mechanism. Not change the message. What to do ? I have the washing machine dwc-ld1413. The machine is switched off at the 48 minute out of 50min. And I need to restart it again and again until it suddenly passes to 47 minute and then continues until the end normally. What could be the problem? And how we can fix it? The total washing time of 1 hour sometimes taking all the day(((… please, help. I have washing machine, Daewoo E1212 and is showing error code E6 on the electronic panel. What to fix? CAUSE = The laundry is jammed between the gasket and the drum… Rearrange. SOLUTION = The motor is faulty. Change the motor. Machine takes in water, but it doesn’t go through the drum it leaves straight from the filter, what’s wrong please? You most likely have a siphoning issue. Check the drain line on the back of washer and be sure it is positioned properly. You may also have a drain pump that is stuck open and the water drains right out. Can you give us the model number of your Daewoo Washing Machine? Previous post: How Do I Remove Watermarks And Cup Rings From Wood Surfaces?